Vilcabamba is one of remotes areas to visit in the jungle. 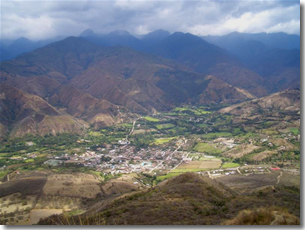 In Quechuan, Vilcabamba means "Sacred Valley". Actually the word is comprised of 2 words: "huilco" and "bamba". "Huilco" meaning sacred or god and "bamba" meaning valley. It can be translated to English as "Sacred Valley" or "Valley Of God". With the name of Vilcabamba is known a ridge that rises over the 6000 meters above sea level and it acts as a divining wall between the departments of Cusco and Apurimac. Besides being a place that has an abundant fauna and flora, the region covers and houses very interesting and not so well known archeological remains like Espíritu Pampa, Rosaspata, Choquepalta, and Yuracrumi and many others, all discover by Hiram Bingham after finding the citadel of Machu Picchu. The Vilcabamba Inca city is the subject of many tales, myths about hidden treasures. Constructed in 1539, the city was crushed by the Spanish army in 1572, signalling the end of the Inca resistance to Spanish rule. Inca ruler Manco Capac has tried to resist the conquistadores by raising over 100.000 troops, but the Incas soon found themselves on the run through the Sacred Valley towards the deep Amazonian jungle, where they could not fight the invaders. The Spaniards have reached the stronghold of Vilcabamba and destroyed it with ease. The city was burned and the area became a remote area of Peru, the location was forgotten. Today, not much can be seen at the spot except a few rocks. To access Vilcabamba one must go on a long journey but very spectacular is about 44 miles from the short cut in the route of Quillabamba and to access this asphalt road that has spectacular scenery of the Vilcabamba River going over the towns of Huayurran, Yupanca, Pucyura and Huancacalle. Another way to get there is to start from Quillabamba, by any truck to reach Yupanca, Pucyura and Huancalle.